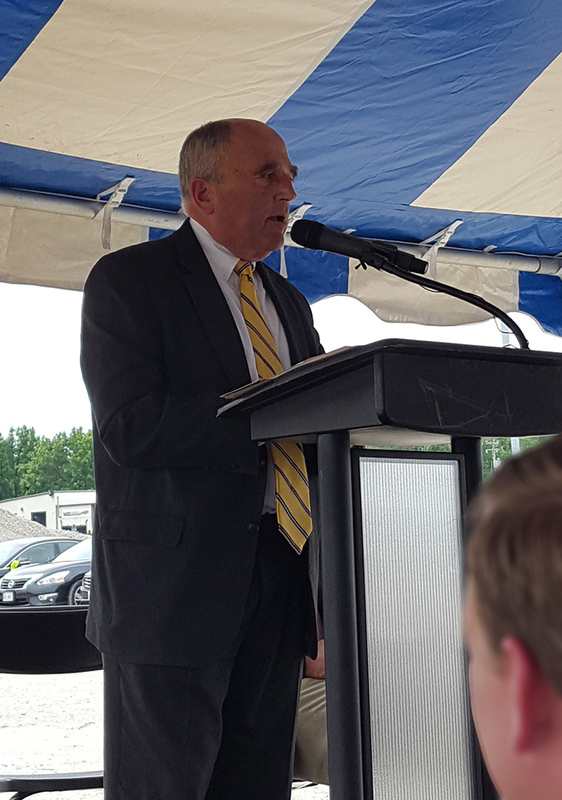 This article features Virginia Maritime Association member, InterChange Group Inc.
PORTSMOUTH | InterChange Group Inc, a third-party logistics provider, hosted a tilt up ceremony on July 19, 2017, for their new warehouse on Elmhurst Lane in Portsmouth. This is their second facility in Hampton Roads, adding to their 17 other food grade facilities operated on the East Coast. The new 200,000 square foot warehouse will allow them to handle a higher capacity of imports and exports moving through the port. Keith VanBenschoten, COO of InterChange, said the company picked the Portsmouth location because of its access to rail, interstate and Virginia’s Ports. “Our intentions right now are to operate a 3PL operation out of about 54,000 square feet... We unload the goods, sort it, palletize it, do whatever we need to do, store it, track it and then ship it back out to our customers or their customers.” said VanBenschoten. InterChange’s significant investment in a speculative warehouse demonstrates the business community’s confidence in the direction and future of our port. The new warehouse’s opening date is currently set for November.